The University of Lynchburg School of PA Medicine celebrated PA Week 2018 with service in the community and a cookout with local physician assistants. 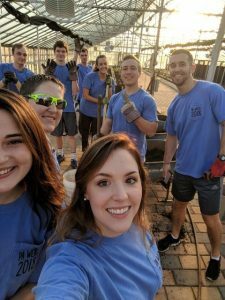 On Friday, October 5, the PA students divided into groups to volunteer at several locations in the Lynchburg area, including Gleaning for the World and Lynchburg Grows. They also delivered gifts to PAs working in local hospitals and clinics. The day culminated with a celebratory cookout at Peaks View Park, where they collected non-perishable food for a local food bank. Organized by the American Academy of PAs, PA Week is an annual celebration from October 6-12 recognizing the PA profession and its contribution to the nation’s health.